Take me to Conscious Eating 101 now!!! This eCourse will inspire you to shift your food choices into the healthiest high vibe options available! 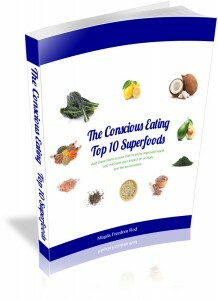 Conscious Eating 101 is about expressing love: self-love, animal love, and planetary love! Conscious eating is a program based on ahimsa (non-harm) that focuses on being mindful of the food choices you make, and how they affect your health, the well-being of animals, and the health of the planet as a whole. Each bite we take not only impacts our health, but is also a vote for the kind of world we want to create. Our actions and choices are powerful, and far more than most of us realize. Why not use them to create a world where all living things can thrive as a result of being deeply nourished and honored? Conscious eating is about ethics, respect, health, sustainability and LOVE. It means bringing our food choices into alignment with our values.